In many houses, Halloween leaves behind an abundance of candy. Either you bought too much for the trick-or-treaters, or your little ghouls and goblins brought home more than you would have liked. Don’t worry. There are a few things you can do with leftover Halloween candy to get it off the counter. 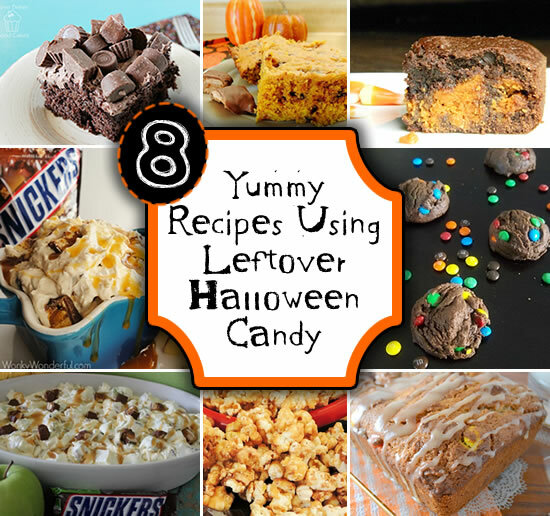 For starters, you can make cookies, cakes, and dips with leftover Halloween candy. When you think about it, it sounds sort of silly – candy dip? But before you toss the idea out the window, check out some of these recipes I found. You’ll be amazed at the treats you can make with leftover Halloween candy. Those Butterfingers and M&Ms will be a hit at your next game day party or holiday celebration. M&M Chocolate Pudding Cookies. M&Ms and cookies have always been a great combination. When you add pudding, though, they reach an entirely new level. You can use any flavor of pudding – try butterscotch, vanilla, and even banana pudding in this recipe for a unique flavor! Chocolate Wasted Poke Cake. Did you watch GrownUps with Adam Sandler? Remember “chocolate wasted”? Chocolate lovers won’t be able to get enough of this poke cake. It uses chocolate pudding, chocolate cake mix, and chocolate candies. Reese’s Pieces, Butterfinger bars, and Rolos would be great on top. Snickers Salad. No lettuce or tomatoes in this one, but you can certainly tell yourself the apples make it healthy! This salad has apples, caramel, and Snickers bars in it. Creamy Snickers Dip. Somewhat like the salad, Snickers Dip is a creamy version of the candy, using cream cheese and caramel. Try it on graham crackers, apple slices, and even pretzels for a great snack! Reese’s Pieces Peanut Butter Banana Bread. Who doesn’t love banana bread? The Reese’s Pieces are baked right into the bread, so you end up with a version of peanut butter and banana that doesn’t stick to the roof of your mouth. Butterfinger Fudge Brownies. How do you feel about candy corn? Some people love it, and some people loathe it. This recipe uses candy corn in a way that might just make you fall in love with it. Pumpkin Butterfinger Blondies. These blondies would be a terrific addition to the Thanksgiving dessert menu. They may even replace pumpkin pie. MVPeanut Butter Snickers Popcorn. Even if your team loses, you’ll still be a winner amongst your guests with this popcorn recipe. You could also wrap it in some cellophane and tie a festive bow around it for a great homemade holiday gift. If you’re a little less than enthused about the calorie counts that come with some of these treats, you can always freeze most of it and thaw it out in small portions. Candy bars and chocolates freeze really well, though things like gummy bears and Starburst won’t be very pliable when thawed. An added bonus to freezing candy is that it’s easily chopped up and used for an ice cream or frozen yogurt topping! How do you use up your leftover Halloween candy? I love these ideas! Especially the Snickers dip! These all sound delicious! I've heard that Snickers Salad is really good, and I've had the intention of making it at some point!